In a surge of desperation to find something to give your S.O., you’ve found yourself under fluorescent lights. The cashier waits while you contemplate a pine-scented air freshener over some extra USB charging cables. You sigh deeply. If only you had read this post about last-minute Christmas gifts in Saskatoon! You can’t believe you let yourself get to this point: last minute shopping in the only place that’s open… the gas station. You don’t want to go back. So you have like, 3 days – there is no need to be so dramatic. Now is the time to lock down bae’s Christmas gift, or risk looking like you don’t give af about them. Do they prefer hearing how great you think they are over a new watch? Take time to spell it out for them in a heartfelt letter. Or, could they use a day with you all to themselves instead of a fresh pair of kicks? Set aside a date and keep them in mind when planning memorable activities. If your S.O. is the foodie type, you can’t go wrong with a basket full of local sweet and savory snacks. Shops like SaskMade Marketplace put it all together for you, or you can customize your own gift bag. My favs include: popcorn seasoning, pemmican, fudge, and pickles. If it’s too early in the relationship to guess their shoe size, grab ’em a bag. Saskatoon’s vintage shops are stocked with hip bags, or purses. These places are notorious for unique open hours, so check Google before you show up on Christmas Eve. Hey, they could be into it. At the very least, you’ll have a good conversation starter. Two Saskatoon shops opened just in time for the holidays, Living Skies Cannabis and The Pot Shack. Remember to pay cash. Tasty Buds are back in stock! Again: NOT REAL. Pure innocent chocolate. Plenty of shops around town carry stylish and affordable designs. Make it easy and head to Joyne on Broadway for a good selection in one place. Pop a succulent or air plant in a quirky planter and BOOM! You’re done. Plenty of places including Solar Gardens, Dutch Growers, and Bills House of Flowers stock these babies. Try a new sip from one of the craft breweries and distilleries in town. Your best bet is to purchase the growler with a future fill for ultimate freshness. The newest brew stop in town is Shelter Brewing Co., or try purple wheat vodka from Stumbletown Distilling. You know all those art markets and craft shows that you totally missed out on over the fall? Well, you can still find these unique items on display thanks to places like The Hobnobber. You’re bound to step up your last-minute Christmas game with these local gifts. So get out there and hit a home run! It’s been nearly 2 years since welcoming this bundle of a business to Saskatoon. January 9, 2017 marked the birth of DoSask.com. What began as a space for people to find Saskatoon’s date ideas all in one place has become a growing regional media and events company. In the summer of 2016, I had the opportunity to move back to my hometown of Saskatoon after eight years away in Alberta. At first, I was hesitant about moving back. At the time, I was working as a writer in Calgary and found plenty of reasons to be content with the lifestyle there. B) say that it’s a beautiful city with nothing going on. …As if I’d never experienced the struggle myself. But I did my own research and discovered that Saskatoon was in the midst of an exciting change. I began creating mental lists to keep track of it all. Hearing people say, “I wish I would have known about ____, or else I would have been there”. No more excuses! Sharing local dates with people who, like me, were feeling overwhelmed. Forcing myself to focus on positive aspects of the city when I felt isolated. Loneliness is pervasive as someone whose only company is a cat most days. Showcasing my content to potential clients and practising WordPress, HTML, social media, digital advertising, etc. There are similar blogs in major cities across Canada. Most of them can’t rely on advertising dollars alone to keep the lights on. So, I began producing experiences such as speed dating and brewery tours to bring some big city excitement to Saskatoon. I’ve also hosted dozens of free, or donation-based events with proceeds to local charity. Back in January 2017, I figured it wouldn’t take long to get everything you could possibly do in Saskatoon listed on the site within a month. It was a naïve goal. I’m still finding new things to do every day. It’s a challenge to dig deeper than surface level and maintain a whole city worth of adventures! 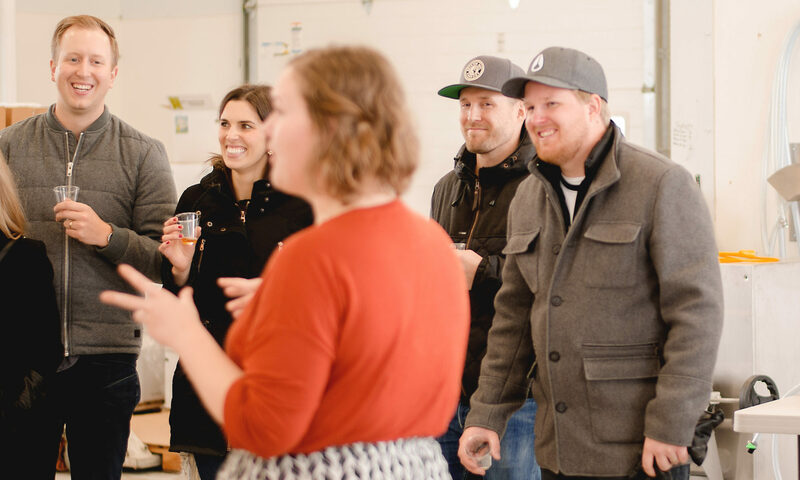 Do Sask has become something a lot more than I had originally intended it to be: it’s a community of people who are passionate about local arts and culture, who are willing to try things totally out of their comfort zones, and who are ready to connect with other locals face-to-face. It exists to help people who feel disconnected and stuck – they’re moving to town, looking for an offbeat experience, or switching up their same old routine. The best part about running Do Sask is that I feel part of the city in a way that I never have before. I get to tackle topics like a culture journalist instead of a bored copywriter. I’m excitedly attending local events on top of running my own productions, meeting unique people, and learning tonnes of new things as I go. Do Sask has been featured in the Saskatoon StarPhoenix, CTV Saskatoon Morning Live, CTV News, Saskatoon Morning on CBC and Global Saskatoon. After a year of major growth, there will definitely be lots more to come in the New Year. Whether you’re reading this from home, or showing up to a new event for the first time – thank you for supporting this bright pink dream and helping bring energy to this community. I like to know the work I do has an impact on the quality of life for folks in Saskatoon. If Do Sask has improved your nightlife, drop me a line.